We would love to have you come out and visit our 60 acre waterfront farm located in Oakman, AL. Appointments are required and directions will be provided. If you visit, you can pick your own plants and many larger divisions are available. There is a $1,000 min. purchase of plants asked of visitors but you do gain a wealth of knowledge and a wonderful experience. Over one mile of pathways is located throughout the groves. We enjoy you visiting and will always try to make time for tours. We will answer all your questions and show you through the bamboo groves. 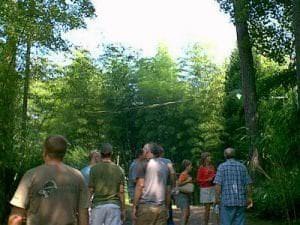 Visits have to be made by appointments due to the amount of time required to tour our groves and purchase bamboo. Appointments are made Monday through Friday, 9 am to 4 pm to select and pick up bamboo. On average each visit to our bamboo farm will last from 2 to 3 hours and is concluded with us preparing your bamboo for your trip home. 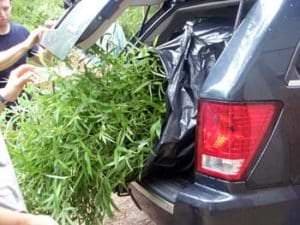 We will make sure that your bamboo is properly loaded and protected for your ride home. 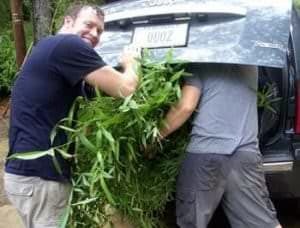 We will load all your bamboo and protect it from wind for the journey home. We wrap larger orders in plastic to prevent wind damage. Smaller containers can just ride within the vehicle if there is room. Below you can see some large three gallon size plants being loaded. 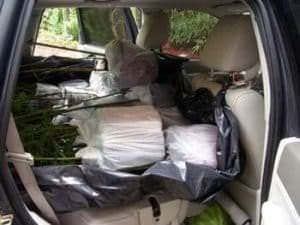 If you pick-up three gallon size plants you can usually get larger ones that cannot be shipped in the mail. Some of our packing methods occasionally entail employees getting closed insides doors. 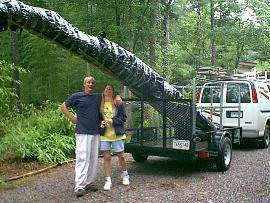 Here are some large bamboo orders that are wrapped and ready for travel, pictured with happy customers. There is no minimum for online purchases, so if you wish to purchase a small order it is best to have it shipped. Our nursery and farm are growing grounds and not a garden center. There are nice pathways through out the groves, but there are areas where walking can be tricky. 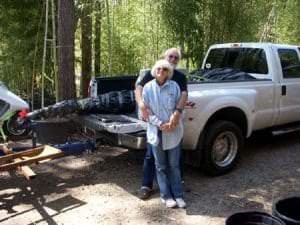 Our home-based groves are located on flat river bottom land with only a small portion have any hills. Please wear appropriate footwear and all children must be well supervised. 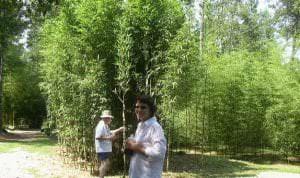 You can visit our our blog to see many photos and articles written about some of our guest who have picked up bamboo here. 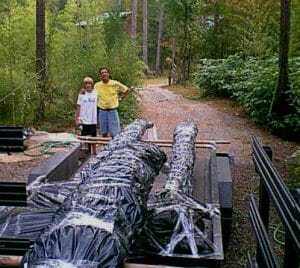 There are hundreds of photos, many showing how we prepare your new bamboo for its trip home. There are ample selections of plants ready to be purchased, but our stock has a large turnover and changes weekly. Depending on the time of year, our inventory of containerized bamboo varies from 10,000 to over 40,000. The container sizes vary from the small one gallon to huge 65 gallon weighing over 350 pounds each. We will provide directions to our nursery once your appointment is confirmed. A liability release form must be signed prior to touring the grounds. Animals are welcome but dogs must be kept on a leash due to the damage they may cause or possible injury to them by running freely throughout the bamboo forest and surrounding woods. Children need to be well supervised due to the terrain and adjoining river that surrounds our bamboo nursery. Payment terms: Orders picked up here must be paid by cash or credit card. Thanks, and please contact us and we will be happy to set you up an appointment.